Last week, I picked up a book that I’d never read by an author that died shortly after I was born. Although he was a well-known writer, I had never read any of his books. When I finished my selection, I couldn’t believe that it took me so long to discover him. It’s very rare for me to be so mesmerized by an author after reading only one of their works, but it does happen. The book was “In Cold Blood”. 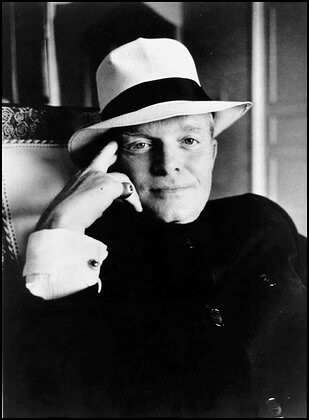 The author: Truman Capote. This piece of non-fiction reads like a novel, but it is a true story and a chilling one from start to finish. The murder of an entire family is not pleasant subject matter, but that is what this book is about. Capote, though he wasn’t from Holcomb, KS, and didn’t know the people involved until after the crime occurred, wrote this book and made it seem like he had been an eye witness to every perspective held within it. I know that he undertook a tremendous amount of research to complete this story, and it shows. Though the crime itself was horrendous, the focus is not on the gruesome factors of it, which seems to often be the temptation of many writers. Capote, instead, made this book about people. The family that died. Their friends. The law enforcement officers who didn’t give up until the killers were captured. And, of course, the criminals themselves. While the crime itself was definitely what made this story an unthinkable tragedy, so also did the lives of the criminals. Perry Smith, in particular, had a terrible upbringing. Of course, not everyone who experiences abuse as a child grows up to be a killer. That is a rare occurrence. But there is enough detail given about his life to make one wonder if his earlier days had been different, would he have grown up to be the same way. Knowing what I know at the basic levels of nature vs. nurture, I saw that Smith most definitely had mental problems. Paranoid Schizophrenia, as he was believed to have, does not automatically make a person violent. But couple that with the abuse and neglect he endured as a child, and it becomes evident that multiple factors contributed to him becoming capable of murder. His accomplice also had suffered a traumatic brain injury, which, when brought into account along with other abnormalities, could explain a lot about the person he became. The takeaway, psychologically, is what continues to fascinate me about human beings. We seem to be born with our own unique set of DNA, and then environmental factors, often those beyond our control, have a tremendous amount of impact on what type of person we become. This doesn’t excuse criminal behavior, but I think it’s worth trying to understand. People who seemingly have no conscience are not “typical”. Understanding how and why it occurs is something that will always intrigue me. Blood is one of the best books I’ve ever read. I don’t know what that says about my tastes, but subject-matter aside, the writing was nothing short of awe-inspiring. I’ve never read anything like it and came to understand why Capote was such a braggart about his skills: it’s not bragging, though, if you can do it, right? Only a truly great writer can transport their reader to another time and place and make that reader feel like they were there. Only a truly great writer can give the reader goosebumps without completely engulfing them in fear. Give just enough of the details without drowning the reader in unnecessary commentary. Only a truly great writer can make you feel compassion for every character, even if their personalities and problems and behavior run the gamut from extreme to extreme. I only picked up the book after watching the film about Capote a few weeks ago. I really don’t know if I’d have ever read it unless I had seen the movie about his life. But I’m glad I did. My feelings about the book, but mostly the writing itself, has sat with me over this last week. And that, to me, is the most important defining factor of a great author: if their work and skill with language leave me breathless, if they make me want to read more, if I just want to know more about them, if it inspires me to write more and write better – that is what separates good writers from great ones. And Capote was, in this writer’s opinion, a literary genius.